This website is about New Zealand waterfalls. It was created with the purpose of helping people to find and reach waterfalls with a minimum amount of trouble. It is completely searchable, with every waterfall having an entry that includes the waterfall name, a description of the falls, directions for the road and the trail, and the waterfall's vital statistics and photo. Each waterfall is also rated and includes honest advice for the best time to go to the falls. If you are looking for visiting the most popular/easy accessible waterfalls, please refer to the Must See Waterfalls article. If you are searching for waterfalls in a specific region, please refer to the Waterfalls by Region tab. If you want to see all the New Zealand waterfalls on a map (TOPO or Google maps), please refer to Waterfalls Interactive Map tab. 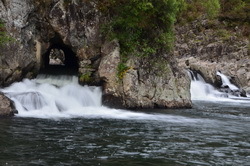 If you would like to get a list of all New Zealand waterfalls or searching for a waterfall with specific criteria, please refer to the Waterfalls Custom Search tab. 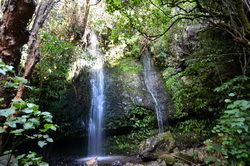 Wonderful swimming spot, Dickey Flat Waterfalls, also know as Waitawheta Cascades, are accessible via a gorgeous 1hr 20minutes' return walk at Karangahake. 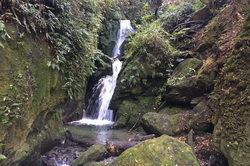 Hidden gem, Newton's Waterfall is easy reached via a 20 minutes' return walk near Akaroa.